With the button “Delete Database,” you may delete all information about the current synchronization state. No files will be deleted. Easy2Sync will simply “forget” what the contents of the directories last looked like and only work with the data currently visible. The next sync will automatically rebuild the database. With the checkboxes to skip reminders you can tell Easy2Sync to skip the "reminder" property (that shows an alarm in Outlook) when copying calendar items or tasks. If the calendar item / task already exists in the target folder its state of the reminder property will be preserved when it is replaced. 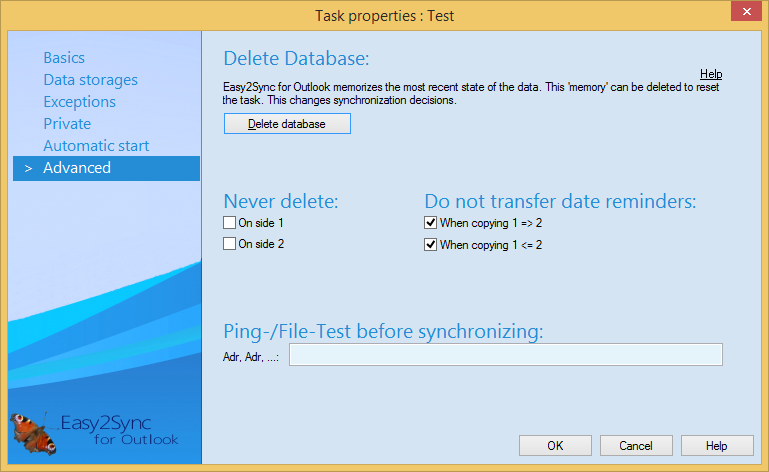 For synchronization tasks it's usually a good idea to activate none of the 2 checkboxes or both.. Finally you can enter IPs, computer names, file or folder names to check before the sync. If any of the checks fail, the sync is not run. Separate multiple values with commas.